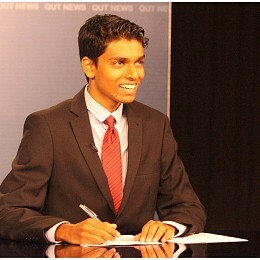 SBS News Cadet Journalist. Formerly Casual Sports Journalist with 10 News Queensland and Video Producer the Roar Sports. Why does cricket produce some of the ugliest kits in sport? When Australia takes on India over the next week, they’re going to have a very distinct yet also very familiar look. 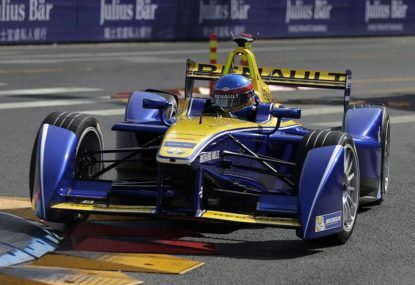 It seems in the case of Formula E that lightning can strike thrice. There is always something special about meeting your sporting hero. Holden Australia have confirmed they will stay in the Supercars Championship from 2017 onwards, with Triple Eight Race Engineering to represent the Holden Racing Team for the next three years. 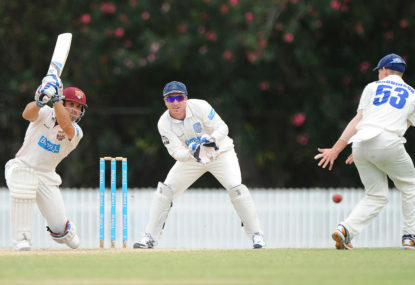 I watched as much cricket as I could last season, but I didn’t listen to a minute of the Channel Nine commentary team. Russell Ingall will continue to race in his retirement, with the V8 Supercars veteran confirmed to partner up with Rick Kelly in the No. 15 Sengled Racing Altima. Is it the end for Volvo in V8s? First things first, don’t Panic. 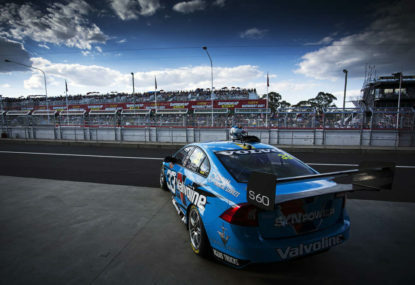 Volvo are still racing this year, Scott McLaughlin still has a chance in the championship. 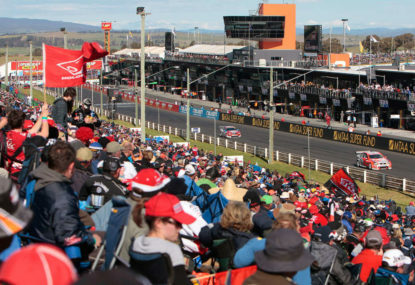 The next chapter of the V8 Supercars season is in full swing. 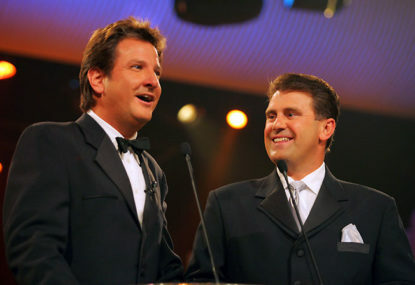 After three races on Australia’s eastern coast, the series takes a three week break to trek across the Nullarbor to Perth. 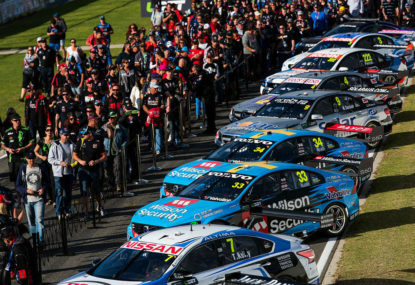 It’s the end of an era for Australian touring car racing. After 19 years flying the V8 Supercars flag, Australia’s premier motorsport category will drop the engine configuration from its name. Overnight, news broke of some exciting sponsorship news for V8 Supercars. 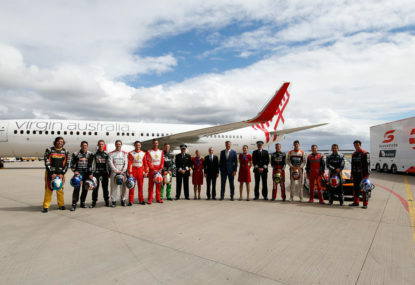 The biggest news from the News Corp report suggests that Virgin Australia will support the category from July, becoming the naming rights sponsor from 2017. 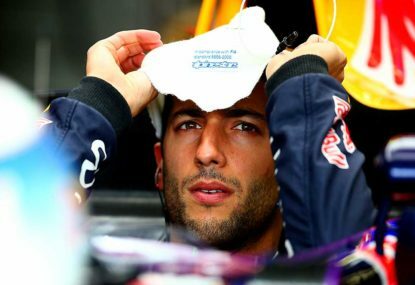 Why bother being a Formula One fan? 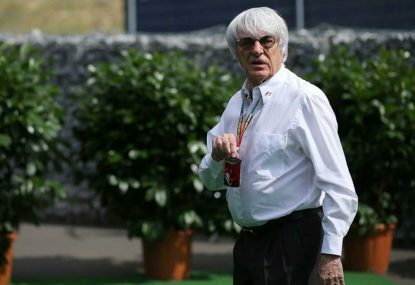 I’m struggling to describe the erratic, bizarre behaviour of Formula One over the last month. Is it a mid-life crisis? What does Sky's exclusive F1 rights mean for Australia? Sky F1 has been awarded exclusive Formula One rights in the United Kingdom from 2019 until 2024. But what does that mean for Aussie motorsport fans? A lot of people refer to the early 2000s as the glory years of Formula One. It was free on TV, all the teams had healthy rivalries and Herman Tilke hadn’t designed half of the tracks. What does V8 Supercars do if Gen2 fails? “We’re up the front and here to stay,” stated Lee Holdsworth in April 2014, after taking the Erebus Mercedes AMG V8 Supercar to its first win. Within two years, that Mercedes AMG Supercar is now on the scrapheap. Got nothing to do with federal politics mate. It’s all about the stimulus that goes into making decisions. The leadership spills and the decision to cheat all stem from the fact that the people involved were stuck in a bubble where they were cut off from the outside world and rational thinking. In the bubble, They are so focused on a certain metric (winning/poll numbers) that they are not only making irrational/unsporting/plain stupid decisions, but they can’t fully grasp the potential consequences of their actions. 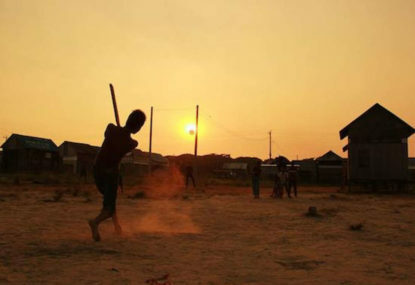 The bubble in the case of our cricketers was created as part of the ‘high-performance’ culture instituted by the Argus Review, and whilst it may have lead to a few Ashes wins at home, it has deprived our cricketers of the ethical framework required to make the decision not to cheat. 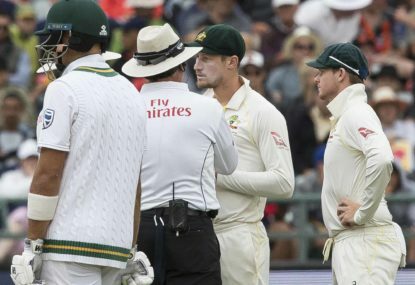 During the immediate moments after the Australians were caught out cheating, the reactions of the leadership group suggested that they thought they had done nothing wrong, or wrong to the point of there being serious retribution. It was only when Warner, Smith and Bancroft were taken out of the atmosphere of the Australian camp that they realised the full consequences of their actions. That’s why they were inconsolable when they arrived back in Australia. Whilst the players do need to take responsibility for their actions, it was clear that they were not thinking in a rational way when they made that decision, and for that, a culture which valued winning over fair play holds considerable sway. Apologies if my psychoanalysis was a bit hard to parse. At least F1 will be on some screens in Australia. IndyCar has gone from having a race in Australia ten years ago to no TV coverage at all this year! Game one at Spotless got 21K (Capacity), around the same as the average for Thunder games and Game Two got 27K, down on Brisbane’s average last year, although the lack of Chris Lynn and the fact that Brisbane fans are quite picky probably contributed to that. If they perform well I reckon we’ll see a lift. 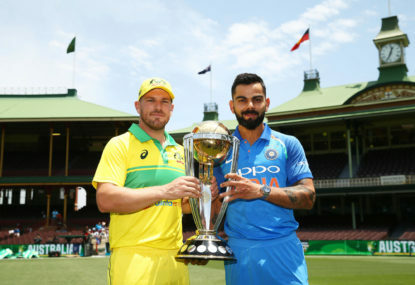 I would bump One Day Cup to March and cram in a whole Shield season from Late August to Early December, 10 rounds with the possibility of a shield final during the gap week in the test schedule, ideally placed so a broadcaster could pick it up. The BBL has been in the sweet spot for comp length over the past few years, we’ll see this season if the tournament feels overlong. Exactly. It is possible to be a person of faith and support a secular society. I find your position on this most interesting. You relate LGBTI people to children, who are not capable of making their own decisions, and are not fully developed mentally? At the risk of sounding quite condescending, I find that particular argument quite condescending. In my opinion, these are grown adults who are capable of making decisions by themselves. If they want to marry, so be it. And it is a fallacy to say sport should be apolitical. All sport has and will be politically framed. If one is to believe sport is apolitical, one should have strongly objected to the boycotts of sporting events in Apartheid South Africa. Yeah. The WEC and the ACO are now facing the same issue in LMP1. Never push out your privateers, it is their effort, dedication and passion that keeps a series afloat. Same. The aero made racing dull as dishwater as well. It’s really a stretch to call it a touring car championship, they feel like empty shells with Formula 2 engines in it. Hope that the Mercedes exit gives them a good excuse to shape things up. Thanks for the kind words. He was great to speak to. There was a whole section on his thoughts about wicketkeeping that didn’t make the final draft. A real shame he never got a baggy green. The majority of the crowd was on the camera side, in the shade away from the sun. Supercars has the broadcast deals in place, but most of them aren’t with the same networks who show F1. Because of that, F1 can’t produce a good lead in for viewers into the V8 race. Also Supercars doesn’t have a huge amount of live TV coverage internationally, mostly streaming on SuperView. If Liberty Media is willing to put the support races on the same deal as the F1 rights I think we’ll see some good exposure. I think the main issue is that the Albert Park support bill is too busy. F1, V8s, Aus GT, a whole load of other categories and demo events. You could try and cut down everything just to F1, V8s and Aus GT. The other issue is that these races aren’t part of the broadcast package for Formula 1 overseas, so the international exposure is very limited. Because of that the benefits feel more limited. Given that overseas support categories have managed to get one hour slots on the F1 Support bill, I think the organisers need to think about emphasising quality over quantity. The event would work much better with longer races and pit stops – they have had their own pit building since 2010, so it’d be pretty easy to manage. 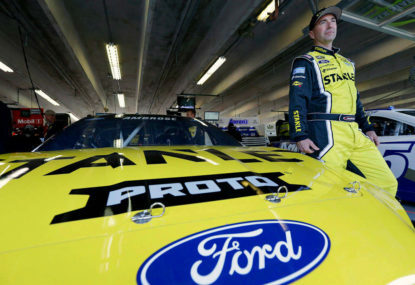 Maybe turn the non-championship event into a bigger spectacle – how about an All-Star Race – Run with a few different rules, maybe allow a few international wildcards in the race. NASCAR run their all-star race pretty well, and its non championship event. And that’s the problem with touring cars on an international stage. That’s why the World Touring Car Championship is completely pointless. Each series has different regulation and is selling cars tailored to that region. The only real way I could see Supercars being an international championship is an increasing in Asian manufacturers as well as adopting the ‘Class One’ touring car regulations currently being drafted by the WTTC, DTM in Germany and Super GT in Japan. But would it be worth selling the Australian spirit to create what is a slightly higher profile Asian touring car league? Holden are introducing a V6 Twin Turbo 2017 Commodore next season. What Nissan and possibly Ford do is another question. V4s are technically possible with the regulations, as well as Wagons and Hatches. The trend for touring cars seems to be cheap hatch back racing. BTTC started it off and TCR is working hard to make it a global formula. But those series aren’t perfect. Both have success ballast, which ruins the purity of the racing. Australian’s like their cars a little bit more musclier, something which doesn’t really gel with manufacturers today. They want efficiency, not excess. It’s a difficult one for sure and I think the possibility of a format shift, maybe to GT4 spec may be in order. 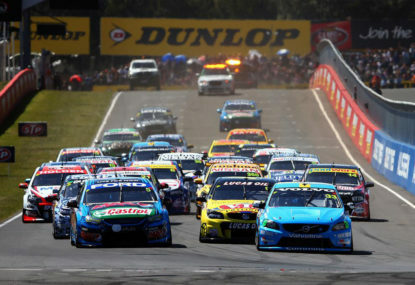 I think V8 Supercars needs to eat some humble pie and consider getting V8s on the support bill at a major race, either in Asia or possibly in the US or UK. Its much easier to introduce the V8s as a support category at a major race meeting. For example, if the V8s were on the bill at Long Beach, alongside Indycar and the IMSA Le Mans series, you’d be able to expose the series to a packed crowd and a live TV audience. Then he should have redressed on the start finish/mountain straight. This isn’t a video game, you can go a couple of corners without getting a penalty and then redress where it is SAFE to do so. I wouldn’t call slowing on the the racing line, blocking another car safe. I do agree with you that Whincup is not wholly to blame for the running off, but it was his decision to redress when he did. Whether he did so because of good sportsmanship or to avoid a potential penalty we don’t know. The redress rule doesn’t say when you need to redress, it would be up to the stewards who would see a reasonable time to do so before adding a time penalty/stop go penalty, like what happened with Rick Kelly in relation to his crash with Chris Pither. Also, you asked when is it legal to block someone on the racing line. Whincup was on the racing line, and stayed on it when he tried to redress. Thats not okay. If you redress, you move off the line. He stayed on the line and blocked Tander, who had nothing to do with the incident before. Whincup failed to redress, and also caused a collision by backing Tander into the path of McLaughlin. 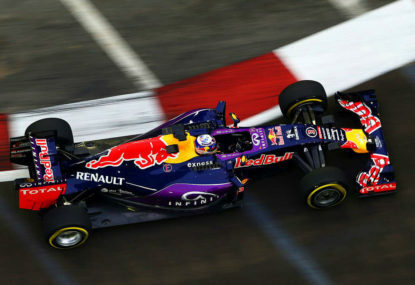 Thats what the officials gave him the penalty for, even though he did not directly collide with the cars. Ultimately its up to the stewards to decide whether Whincup redressed in a safe place to do so. The fact that he redressed in a corner, on the racing line, blocking another car and ultimately causing a collision is why he deserved his penalty. To be honest of all the drivers who deserve the blame it is Whincup. First off, had Whincup not attempted to redress at the Chase, McLaughlin would have rejoined behind Tander, meaning that when Whincup redressed on the start/finish straight he would have lost the place to Tander. So he irresponsibly slows up at the chase, backing into Tander and allowing McLaughlin to get alongside. McLaughlin would have struggled to keep control coming out of the chase, given that the tyres would have no grip, meaning that his collision was inevitable. Had Whincup not slowed down, McLaughlin would have rejoined safely behind. 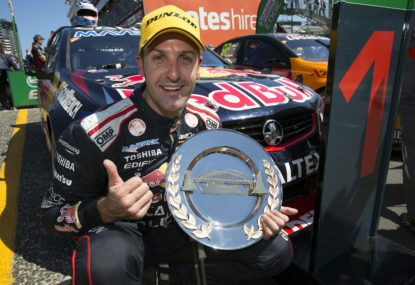 Its Whincup’s desperation to keep the effective race lead that resulted in this rash move. Whilst he is not 100% to blame, his penalty was deserved. If anything, this is going to drive away participation in clubs and increase it in private schools, who won’t adopt these rules. 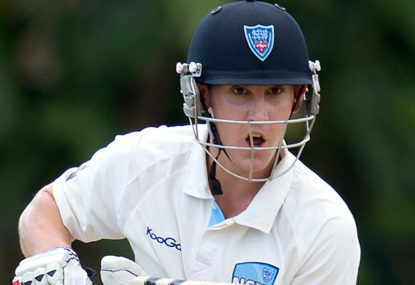 Parents who want their kid to be the next Steve Waugh aren’t going to settle for this. You’re going to end up with a two tier system, where the players from private schools who went through the proving grounds are miles ahead of the cotten wool kids in the club system. The only thing I like is the T20 option. But that should be the limit of the changes. Shortening pitches is going to make the 13 year old tearaways even worse to face up to…reducing team sizes doesn’t really make a difference, aside from increasing the gaps in the field. That said, its a trial so theres a good chance this won’t be rolled out. Its still ridiculous. We could get to the point where we have 7 or 8 regular teams and 5 or 6 part time local teams which just compete locally, who could enter cars just for that round. I don’t think that’d be unhealthy, if anything it could easily expand the teams competing in the championship. I don’t know why Bernie doesn’t read the comments of motorsport articles on The Roar. But then again, he probably doesn’t use a computer anyway. 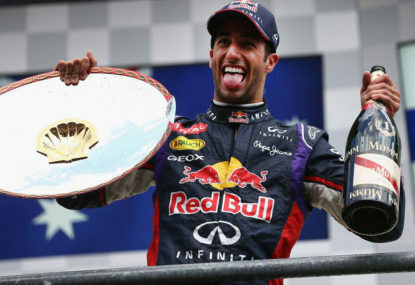 I think that F1 should take a leaf out of the Supercars book and do a European cup. Perfect way to keep the emphasis on the European rounds by giving out some extra prize money. I’d disagree. You ‘re more likely to find an AFL club in Brisbane than it is to find a Rugby League club in Perth or Melbourne. As someone who lives in ‘NRL’ territory, there is plenty of AFL clubs and awareness here.